Radianse, the pioneer and leading provider of healthcare Real Time Location Systems (RTLS), today announced the immediate availability of the T-100 Series disposable patient bracelet, the industry’s first ultra-thin plastic wristband bracelet that incorporates active-RFID technology for continuous patient tracking. Until now, most RTLS patient tracking solutions have incorporated bulky ID-Tags that are similar in size to a typical wristwatch and carry a high cost to purchase. These over-sized tags are strapped to a patient’s arm, clipped onto a patient’s clothing or worn around a patient’s neck with a lanyard. The T-100 patient bracelet sets an entirely new standard that incorporates both an aesthetically appealing design and offers maximum comfort for patients. Radianse is the first RTLS vendor to deliver an active-RFID bracelet solution that has similar physical characteristics to passive wrist bracelets currently being used in most healthcare patient admission processes today. Designed for single-use, the T-100 patient bracelet is ideal for hospitals with stringent hygiene standards and infection control in mind. Most patients do not want to wear an active-RFID tag that has been previously been worn by another patient, even if it has been properly cleaned. The Radianse T-100 ID-Tag is a very low cost bracelet and designed to be disposable after each patient use. The incorporation of active-RFID technology within the patient bracelet allows for automatic and continuous tracking of each patient throughout their entire healthcare stay. Unlike patient bracelets that use static information barcodes or close range passive-RFID, the Radianse ultra-thin T-100 device is a long-range dynamic device that incorporates a battery powered data transmitter. Important status information is sent to a meshed reader network that is able to determine precise location, movement and interactions associated with each individual patient. This valuable tracking information becomes critical data to help administrators and clinicians understand patient flow and throughput. Hospitals that are looking to improve their patient’s overall experience and satisfaction are embracing Radianse‘s technology-based RTLS solutions to provide their staff with the intelligence they need to optimize current processes and operational procedures. By capturing and analyzing the data associated with actual patient wait times and flow, hospital department staff members have the information they need to make changes to streamline operations, eliminate bottlenecks and improve overall patient care. 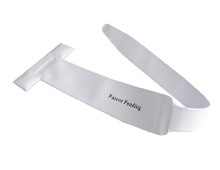 The T-100 patient bracelet is ultra-thin, measuring only 0.02″ in thickness. The bracelet was designed to accommodate a standard one inch printed label for patient information such as name, age, blood type, illness, etc. The T-100 Series patient bracelet is available immediately.